December 11, 2015 – Fort Valley State University aspiring teachers came to the Pettigrew Center to celebrate their official start as educators during the College of Education’s Teacher Induction ceremony held on Nov. 18. During the ceremony, inductees were formally admitted into the College of Education, and 14 students received scholarships to cover tuition and book costs. FVSU early childhood and special education student Shacandice Thomas provided the welcome. The event was held to celebrate the students that fulfilled all the requirements to enter the College of Education. Students had to earn a 2.5 GPA or better, have three letters of recommendation, and pass a background check and the Georgia Assessments for the Certification of Educators (GACE) Test. Dr. Edward Hill, dean of the College of Education, said to an audience of aspiring educators, students and family members that the teacher induction ceremony was a happy occasion. He asked for the audience to give the retired educators a round of applause for educating past generations. “I’m sure many of you are here because there was a teacher who never gave up on you,”Hill said. The keynote speaker for the induction ceremony was Scott Jackson Dantley, a special assistant to the president for Equity and Global Initiatives at the Council for the Accreditation of Educator Preparation (CAEP). The accreditor told the class that male educators, especially African-African men, are “an endangered species” within the classroom. Dantley said teachers are required to make a commitment to learn what they need to know to help all students learn. He said teaching students is a social justice issue, ensuring students from all socioeconomic backgrounds are given the opportunity to learn, grow and develop. The accreditor told the audience there were several practices educators must master to be successful that include knowledge about how young people learn, understanding the subject matter they are teaching students and the skills required to master it. Dantley said effective teachers (in the top ten percent of the profession) can affect 5-10 percent more learning development than an ineffective one. Dantley told aspiring educators about a study conducted by educational researcher Harvard Kennedy. He surveyed 16,000 sixth-grade classroom teachers. They were asked one basic question – What were educators doing to address issues regarding students’ emotions, behavior and mindset? He also told students about Harvard Kennedy’s Seven C’s of Effective Teaching: caring (about nurturing productive relationships), controlling behavior, clarifying ideas and lessons, challenging students to work hard, captivating students, conferring with young people and consolidating ideas to support learning. Dantley also advised educators at FVSU to ensure their department met with community and civic leaders to ensure their program was meeting the workforce needs of corporate America and local businesses. “What we are doing as teachers is classroom management. The impact of this study shows each of those things can have a different effect in the classroom. A good teacher has to be able to display all of those characteristics to be successful, and it also comes down to common sense. People know when you don’t like them, and students know you don’t like them. Think about that inside the classroom, when you enter as a teacher. If have high expectations as at teacher for your students, then they will have high expectations.” Dantley said that at one point, he had decided not to go to college, but it was a teacher that visited his family that convinced him to enroll in college. After Dantley’s speech, the candidates entering the College of Education were recognized by administrators Dr. Gregory Green, chair of the Health and Physical Education program, Dr. Alfrieda Manson, chair of the middle grades education program, and Davine Watson, who supervises the early childhood/special education program, and Dr. Curtis Borne, chair of Agricultural Education. “Teaching is a special calling, and sometimes a challenging profession requiring a great deal of commitment,” said Davine Watson. “Not everyone is well suited to teach, but you will be able to see the results of your hard work every day. 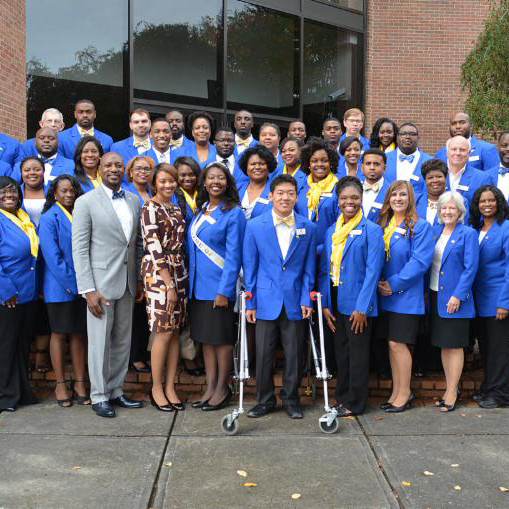 As each candidate was recognized, they received a plaque and a blue jacket donated to them from FVSU’s Class of 1964. Dr. Walter Stephens, principal Thomson Middle School (in Centerville, Ga.) led inductees through the initiation pledge, where they promised to be a proficient educator and pledge to become a proficient educator that was competent in content knowledge and possessed the appropriate technological skills in engage in enhanced learning. Paquita Morgan, an educational specialist from the Georgia Professional Standards Commission, also addressed students. Afterward, members of the Justine Kitchens family and Peyton Williams family presented scholarships to students. A candle lighting and induction ceremony followed.